I've decided to come out and be up front about it. I am a Mormon activist. Yes, I confess, my desire is to change your way of thinking to be more in line with mine. Of course, I believe that what I espouse is truth and will be for your good. Therefore, I have no problem being very insistent that you take a minute and consider my point of view. In particular, I want you to think about the possibility that what I offer is better than what you have. Of more correctly stated, the truth I like to write about can augment the truth you already posses. I can guess what you're thinking. You're probably saying to yourself, "How very offensive! Let's be tolerant. Everyone is entitled to their own opinion. If I want to think differently than you, then that's my prerogative." It's true enough that everyone is free to think and believe as they wish. But I want to be a clear voice in boldly stating my case. Let there be no misunderstanding. I will try to not be "in your face" and you can stop reading anytime you wish. But I make no bones about it. I want to state up front that I am trying to push my points of view forward. I share what I believe in the hope that it will answer some questions for you. To those who don't believe in God, or in life after death, or that there is a purpose to life, I offer this: I believe in God. In fact, I know that he lives and is a loving Heavenly Father. In other words, we are his spiritual children. I know this through many years of prayer and faith. No, I can't prove that He exists any more than you can prove that He doesn't. All I can say is that my faith in God brings me happiness and hope. It fills me with a sense of purpose and meaning. I believe that when I die, I will see God and that He will be pleased with my faith in Him. I am also a Christian. I believe in Jesus Christ. I know that he lived and walked the earth thousands of years ago. He was more than just a good man or a teacher of good ideas. He was more than a prophet. He was and is the Son of God. He is my Savior and Redeemer. He redeems me from death. Because of Him, I know that I will live again. He is the resurrection and the life. He saves me from the effects of my sins. Yes, I believe in sin and I also believe in repentance. I desire to do all those things that Jesus taught. I am happy as I try to do so. A lot of people believe in God and are Christians. Let's narrow the focus of my activism a little bit. I am a Mormon. I believe in restored Christianity. I believe that Jesus Christ established a church is his day but that it was lost over time. Specifically, the authority to preach or to act in His name was lost. I believe that the priesthood was restored through the prophet Joseph Smith and has been on the earth from his day until today. I believe in living prophets and apostles. I listen closely to what they say and try to follow their teachings. I believe that the Book of Mormon is the word of God. It is scripture just like the Bible. I have found much enlightenment in reading, studying and pondering the messages of the Book of Mormon. It has brought me closer to Christ. I have learned many truths that are not found in the Bible and have found greater understanding of the doctrines of salvation found in the Bible. I also believe in modern revelation that has been canonized in the Doctrine and Covenants and the Pearl of Great Price. I wish that everyone would accept and believe them. But what about all those who say they were once True Believing Mormons and then found reasons to no longer believe? Perhaps they don't agree with the stand of the church on homosexuality. Maybe they are upset with the church being involved in promoting the definition of marriage in law as being between a man and a woman. How can I continue to assert that believing in and following the teachings of The Church of Jesus Christ of Latter-day Saints will bring one happiness? It's very simple. The more I try to be a True Believer, the happier I become. But what about the hundreds, if not thousands of websites and blogs that claim to have proof that Mormonism is not true, or that it is a cult, or that we aren't Christian, or that Joseph Smith was a great deceiver? Perhaps you are thinking, "As an activist, do you want me to discount what all these other voices are saying? Why should I listen to you? You're just one voice out there - one blog among so many that are so much more enticing and convincing. Why should I believe you and consider what you have to say?" Trust me, I am not alone in this. There are many millions who believe as I do and wish there was some way to help you to come to the same understanding that what we posses is priceless and of eternal worth. There just aren't very many Mormons that know how to blog, or even know how to use a computer very well. With time, you will see more and more of us clearly share that our beliefs are worth considering and result in happiness. It is unfortunate that so far, there are a disproportionate number of bloggers and websites that do not portray the LDS Church in a very positive light. 7. Why can't I attend a Mormon wedding? Thanks for creating your blog. I enjoyed it very much. Check out mine when you get a minute: realmormonism.blogspot.com. 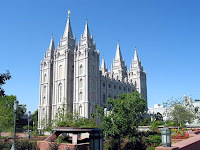 The Church of Jesus Christ (LDS) is often accused by Evangelical pastors of not believing in Christ and, therefore, not being a Christian religion This article can help readers of your blog to clarify such misconceptions by examining early Christianity's theology relating to baptism, the Godhead, the deity of Jesus Christ and His Atonement. The Church of Jesus Christ (LDS) views the Trinity as three separate divine beings , in accord with the earliest Greek New Testament manuscripts. Divinization, narrowing the space between God and humans, was also part of Early Christian belief. St. Athanasius of Alexandria (Eastern Orthodox) wrote, regarding theosis, "The Son of God became man, that we might become God." . The Gospel of Thomas (which pre-dates the 4 Gospels, but was considered non-canonical by the Nicene Council) quotes the Savior: He who will drink from my mouth will become as I am: I myself shall become he, and the things that are hidden will be revealed to him. (Gospel of Thomas 50, 28-30, Nag Hammadi Library in English, J.M.Robinson, 1st ed 1977; 3rd ed. 1988) The Church of Jesus Christ (LDS agrees with Athanasius and Thomas regarding theosis. It’s important to understand the difference between Reformation and Restoration when we consider who might be authentic Christians. . Early Christians had certain rituals which defined a Christian http://sacred-texts.com/chr/ecf/207/2070037.htm , which members of the Church of Jesus Christ (LDS) continue today. . Please refer to: http://NewTestamentTempleRitual.blogspot.com If members of the Church of Jesus Christ (LDS) embrace early Christian theology, they are likely more “Christian” than their detractors. So what do you think the motivation is for the Evangelical preachers to denigrate the Mormon Church? You would think Evangelical preachers would be emulating Mormon practices (a creed to believe, a place to belong, a calling to live out, and a hope to hold onto) which were noted by Methodist Rev. Kenda Creasy Dean of the Princeton Theological Seminary, as causing Mormon teenagers to “top the charts” in Christian characteristics. (see http://MormonTeenagers.blogspot.com) It seems obvious pastors shouldn't be denigrating a church based on First Century Christianity, with high efficacy. The only plausible reason to denigrate Mormons is for Evangelical pastors to protect their flock (and their livelihood). I just realized that when I come on your blog you can actually track me down because you even know where I live. DANG!!!!!!! The tracking is limited to the general city level. That's just the way Feedjit and Google Analytics work. It makes for interesting analysis to see where visitors come from. On my blog, most are from Utah, California and Arizona. You are one of the few from outside the United States. Thanks for visiting. You have a lot of great articles. I am glad that you have written about Mormon activism because it is definitely a big part of the Church's activities and that of its members. Thanks again for producing a great blog about Mormonism. Thank you for the complement. I checked out your blog at Yes I Am Mormon and added you to my blog roll. It looks great. Keep up the good work. You believe that Jesus established the christian church in his day but that it has been lost over time? For starters, Jesus didn't establish any church or religion. He was firmly anti-religion in his views. It was his disciples who started to spread the word about Jesus and call their movement a church. Christianity was hijacked by Constantine and a bunch of priests at the Council of Nicea in 325AD. By that time much of what Jesus had originally said had been changed, deleted or misinterpreted and a bunch of stuff from other religions was mixed in to become the new religion "christianity". Jesus would be rolling over in his grave (if he had one). There's millions of "christians" in the world who believe in Jesus and God, but sadly, they don't know them. They just know of them. With regard to modern revelation from living prophets who are receiving guidance directly from God and Jesus. Do you think it was God or Jesus who said that men other than white-skinned men should not have the priesthood because they aren't worthy because of their lineage? Or is that racism talking? And do you think that God would then suddenly change his mind about this in the 1970s and say its OK for them to have the priesthood now. Or is that because a more liberal and less prejudiced prophet is now calling the shots? You can't say God is the same yesterday, today and tomorrow but at the same time have him frequently changing his mind on doctrinal issues. Guess what? God is the same yesterday, today and tomorrow. What changes is the doctrines of men. Whenever I need to know the truth of something I ask the Lord directly. Now what's interesting about this is that the church tells you to pray to the Lord and ask him questions. But hey, if he answers you, if he talks to you, then you're a nutcase! Why is that? Is it because only the top guys in the church are good enough for God to talk to them? And if God or Jesus tells you something that differs from church doctrine, then hey you must be talking to the devil! But guess what? When you meet God and Jesus you know right away who they are. There's no mistaking them for some other guy! There's such an overwhelming feeling of love and an instant recognition. I have to say here that God and Jesus have told me things which differ somewhat from church doctrine and guess who I'm going to believe? That's right, God wins, hands down. And just like Joseph Smith who said he had seen God and Jesus and nothing on Earth could persuade him otherwise, nothing on Earth can persuade me otherwise either. Thanks for visiting my blog and adding your comments to this essay. You're obviously an intelligent individual and can express yourself well. I like that. You also seem quite familiar with LDS terminology and doctrines. It appears that you are a Christian and have had some revelatory experiences. I would like to focus on that. Your points about Christianity being hijacked and your argument about the early LDS prophets being racists have been well discussed and debated elsewhere so there's no need to go over those issues. Your statement about prayer and receiving answers intrigues me. I would hope that nobody feels like a nutcase because their prayers have been answered. Let’s talk about that. You state fairly strongly that you have received revelation and that God or Jesus has told you something that is different from officially accepted church doctrine. Would you care to elaborate on that? Apparently you have expressed this elsewhere and have been told that you were receiving revelation from the devil. You state that “when you meet God and Jesus you know right away who they are.” Have you met God and Jesus? Did they appear to you like Joseph Smith said they appeared to him? You expressed that you had an overwhelming feeling of love and that there was an instant recognition of who they were. I would really like to know more about this. You say that nothing on earth can persuade you that what you experienced could be from anyone other than God or Jesus so I’m not going to try to convince you otherwise. I am simply curious and want to know more. I believe in revelation and you have shared that you have received direct revelation from God, apparently in an open vision, correct? I know very few people who have shared that they have received an open vision of either an angel or of a member of the Godhead. I have no doubt that there are those who have. My father has shared several times that he has seen my mother who passed away several years ago. Our history is full of people who claim to have been visited by angels. I want to treat this with respect and dignity because you imply that you have met God or Jesus. I’m not saying you are a nutcase or that you were visited by an angel of the devil. I just want to know more about the experience. Were you praying for a specific reason when the visit occurred? What message was communicated by God or Jesus to you? If it was to say that the doctrines of the LDS church or wrong, which ones in particular did they say were wrong? Did Jesus tell you that he didn’t establish a church? Did He say that he didn’t ordain apostles and the Seventy? Did he tell you that he did not send them out to declare His gospel to all the world? Did he tell you He was anti-religious? Please don’t think I’m mocking you. These are sincere questions. I believe you did have a revelatory experience. If you don’t want to share it in an open forum like the comments on this blog, please email me privately. I have an intense interest in understanding all kinds of revelatory experiences as they are an integral part of true revealed religion. Nice site. Nice insights. I appreciate your service. We could use more good content. Thanks for your efforts. I have a great deal of respect for all Christian religions that teach a genuine and sincere need to obey the Lord. But I don't have respect for a lot of the political and sectarian dogma that's out there. Many Christian faiths teach that Mormons are not Christian. The definition of being a Christian is that you know Jesus Christ is God himself, our only Savior, and that we must obey him in all things. Mormons definitely qualify for this. But other Christians are taught not to consider this, but to think of Mormons as belonging to a cult. These "Christians" quote all kinds of creeds and spout weird, twisty logic that says if you want to obey the Lord in all things you are taking credit for your own salvation, so you aren't Christian. They say Mormons are rejecting Christ's grace by taking the Lord seriously when he says, "Be thou holy as I am holy." Trust me, you can argue endlessly with these types Christians that our job is to obey the Lord and they'll come up with a litany of strange ideas about how obeying the Lord is work and work isn't necessary for salvation. When you corner them with scriptures that show you DO have to actually OBEY the Lord in ALL things, you might get a reply that you should show gratitude to the Lord, but that it's impossible to obey the Lord, especially in all things. If you come back with the scripture that says you can obey the Lord because with God all things are possible, they'll claim you're trying to do everything on your own and therefore you have rejected your salvation. They won't even listen to you, nor will they admit how illogical they are being. Did you know, Mormons, since you take the Lord seriously, you aren't Christians. To be a Christian, apparently, according to a number of Christian sects, you have to listen to men instead of to the Lord. Never mind that the Lord said to choose this day whether you will serve him. If you admit that you have to CHOOSE to serve the Lord, you violate some creed or other and fall into a kind of Pelagianism, and that's bad, because it's heresy.